Winner of the prestigious “Best of NeoCon” award, ALUR combines the simple elegance of glass with the precision of cast aluminum. ALUR glass walls transform what was once hidden into an inspiration of form and function. Natural light cascades through the clear glass walls. Architectural details are accentuated. Mechanical components are beautifully concealed. Finally, a wall system that is truly alluring. The ALUR Glass Wall system features ½” tempered glass, polycarbonate “dry joints”, minimal top and bottom channels, and beautify designed hardware, including full height sliding glass door mechanisms that are fully integrated into the top frame of this movable wall system. ALUR Glass Wall is fabricated with ½” thick tempered glass for superior rigidity and sound attenuation. Glass edges are flat polished and chamfered to a precise angle forming a virtually seamless fit when combined with the dry joint. Combined with the discreet glass-to-glass joints and no vertical posts, the ALUR Glass Wall low profile channels create the stunning impression of a vast expanse of unsupported glass. This movable wall system with minimal framing also creates a more streamlined and elegant appearance compared to other bulkier unitized wall systems. The aluminum is bead blasted to prevent fingerprints and for a scratch resistant finish. ALUR Glass Wall dry joints are fabricated from high quality polycarbonate resin that is 93% clear and will not shrink or fade when exposed to UV. The unique tongue and grove design provides a secure glass-to-glass connection and self corrects the natural tendency of glass to bow, especially in larger pieces for a perfect fit every time. 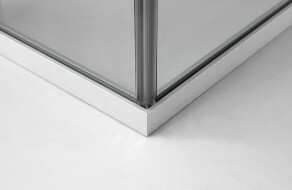 The connection forms a perfect seal preventing any sound leakage through the glass. ALUR Dividing Wall defines the boundaries and function of private offices and conference rooms without separating them entirely from the rest of the floor through the seamless integration of ALUR Glass Wall. Representing the next generation of movable walls, ALUR Dividing Wall features easy to assemble frames, off module design and integrated power, voice and data cabling for greater flexibility in adapting to changes in layout and technology. ALUR Dividing Wall is a componentized wall system that attaches directly to ALUR Glass Wall and fully integrate with MAI System Components. The highly flexible design accommodates 28-½” and 69″ high off module attachment of furniture components and integrated modular Power/Voice/Data. The brushed aluminum finished trim and recessed reveals are designed to match perfectly with ALUR Glass Wall. ALUR Dividing Wall also features multiple tiles, including thermofused melamine, fabric wrapped, marker board and tackable-acoustical options. ALUR Dividing Wall is the exciting new addition to the ALUR product suite that is beautiful, quiet and environmentally sustainable. ALUR Dividing Wall offers exceptional sound privacy with post consumer fiberglass free core. With a variety of finish options, ALUR Dividing Wall is designed to be a flexible solution that fits beautifully into your space. ALUR Dividing Wall tiles are available in Thermofused Melamine, Fabric Wrapped, Marker Board and Tackable-Acoustical options. With integrated voice/power/data, ALUR is as practical as it is beautiful. ALUR Dividing Wall supports off-modular applications and fully integrate with MAI System Components.